Is Your Name on This List? I hope you had a wonderful Christmas with your family, but we’re just days away from the start of the 2018 legislative session. And Iowa Gun Owners is hard at work getting ready for an all-out battle over Constitutional Carry! Just like we saw with the Stand-Your-Ground fight, legislation this important doesn’t become law on its own. Instead, it takes as much grassroots pressure as we can muster, to force the politicians in Des Moines to stand up and fight for the Second Amendment. It’s easy to pass a gun bill. What’s hard is to pass a strong bill that is not chock full of compromises and sell outs. For example, the “Constitutional Carry” bill which passed in North Dakota is so watered down, that it’s now illegal to carry a loaded handgun in your vehicle — a step backwards in their gun laws! In Idaho, Constitutional Carry was watered down to only include in-state residents, serving to trap well-meaning gun owners from other states. And in Alaska, Constitutional Carry was undermined at the last minute to include a requirement to notify law enforcement if you are carrying a firearm. That’s why it’s vital that you and I make sure we get a ‘clean’ Constitutional Carry bill, free of watered down amendments. As part of that process, Iowa Gun Owners has been busy collecting signed petition from gun owners, demanding passage of Constitutional Carry legislation. We will be delivering these petitions to the legislature early in the 2018 legislative session, to make sure they know exactly how important this is to their constituents. We already have tens of thousands of signed petitions printed off and ready to go! But there is still time to add your name to this massive pile of gun owners — if you act fast. 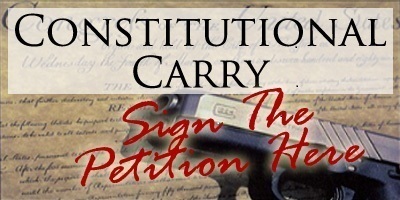 So make sure you are a part of this fight and that your voice is being heard, by signing your petition in support of Constitutional Carry today! Constitutional Carry is no mystery. It simply states that if you’re legally allowed to own a gun, you would be legally allowed to carry that gun without needing to add your name to a government database or pay expensive fees. And despite what you may read in the FAKE NEWS, Constitutional Carry will not allow felons to carry guns. Nor would Constitutional Carry do away with the current ‘Shall Issue’ system, which would simply be optional under this new law. And no, Constitutional Carry law has not resulted in any increase in violent crime in the thirteen other states that have already passed this law. On the contrary, initial research from respected gun rights researcher Dr. John Lott suggests that Constitutional Carry states actually have an even lower crime rate than ‘Shall Issue’ states! And it’s no wonder, as criminals know that the passage of Constitutional Carry law means even more gun owners who will be able to carry for self-defense. But that doesn’t mean that the Sioux City Journal, the Des Moines Register, and the Cedar Rapids Gazette won’t do all they can to distort the truth –- just like they did when they tried to stop Stand-Your-Ground law. The best way for us to combat these lies and FAKE NEWS, is with your grassroots pressure. So again, before we deliver these petitions to the legislature, do your part and add your name now! And make sure that you forward this email to your friends and family so that they can sign their petition as well. We’ve made tremendous progress here in Iowa in the past year with the passage of Stand-Your-Ground law, but it’s time we finish the fight and pass Constitutional Carry law too. We aren’t guaranteed pro-gun legislative majorities like this for long. The last time we had a situation like this was in the late 90’s. We have to act now, while we can. That starts with your signed petition. Once you’ve signed your petition, please also consider a contribution to help Iowa Gun Owners lead this fight in Des Moines! We need help in mobilizing gun owners. We need help to be able to run radio ads at a moment’s notice. We need help to run our direct mail programs, to mobilize as many gun owners as possible. So if you haven’t already done so, please renew your membership in Iowa Gun Owners immediately! And if you have, please consider a special donation to help us with our legislative program! P.S. With the start of the 2018 legislative session just eleven days away, Iowa Gun Owners is getting ready for a major battle over Constitutional Carry! To ramp us the grassroots pressure and combat the FAKE NEWS here in Iowa who are trying to defeat this bill, please sign your grassroots petition now! Once you’re done, please make sure you renew your membership in Iowa Gun Owners for 2018 so we have the resources we need to fight for this bill in Des Moines! Merry Christmas from Iowa Gun Owners!